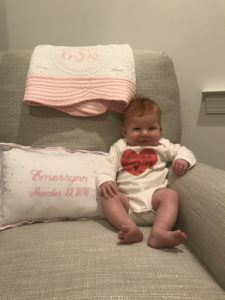 Emersynn was born this past November and is our miracle baby! She is doing absolutely amazing! At our 20 week anatomy scan, we found out that our little girl has a congenital heart defect (CHD). Shortly after this news, we were referred to a high risk OB and a pediatric cardiologist. When we saw the ped cardiologist, he broke the news that she does indeed have a complex heart defect which is VERY rare. Our baby has congenitally corrected transposition of the great arteries (ccTGA), ventricular septal defect (VSD), pulmonary stenosis (PS) and dextrocardia. 1% of pregnancies end up with a baby with a CHD. Out of those one percent, .5 – 1% end up with ccTGA. That is how rare the defect is! Only 5,000-10,000 people in the US have this condition! A little bit about her condition: In ccTGA both ventricles (pumping chambers) of the heart are reversed. Fortunately, the arteries are reversed too, so the heart actually “corrects” the abnormal development, thus the name “congenitally corrected transposition of the great arteries.” However, ccTGA is a complex malformation in which the heart is far from being normal. In a normal heart, the left-side pumping chamber (left ventricle) sends blood to the entire body. The right-side ventricle pumps blood only a short distance, to the lungs. The left ventricle is built to last longer than the right ventricle: 80 to 100 years if no other health problems exist. In ccTGA, the heart twists abnormally during fetal development, and the ventricles are reversed: The stronger left ventricle pumps blood to the lungs and the weaker right ventricle has the harder chore of pumping blood to the entire body. The right ventricle is not built to last as long as the left ventricle. Emersynn is currently almost 5 months old and has not had any surgery thus far! She is defying all odds and doing SO amazing! She is growing well and hitting all of her milestones on or before (!) she is supposed to! This little girl amazes me more and more everyday! She is such an inspiration to everyone around her and is such a strong little warrior! I will never forget hearing my husband ask the doctor “Why is he purple? Why isn’t he breathing?” immediately after Adam was born. Those words were so heavy. They told us Adam had tricuspid atresia. His tricuspid valve never formed and sub sequentially his right ventricle had never formed. Of course these questions immediately overwhelmed me, although I was too scared to consider asking. After the long discussion Adam and his anatomy all I could ask without being scared of the answer was “What advice can you give us?” As one doctor stared blankly I will never forget how the other popped in “You’re going to have three kids, you will love them all the same, one will just have a different heart.” And with that response I was immediately filled with hope. Hope that Adam wasn’t going to die, hope that we would take him home from the hospital and hope that he would meet his brother and sisters. Adam was blessed with great anatomy as far as TA babies are concerned, he was able to skip what is typically the first of three procedures. On October 22, 2014, four days old, Adam was discharged with no oxygen, no medicine, nothing. We had weekly cardiology appointments and the plan was for him to have his first open heart surgery around 4 months. During this waiting period Adam thrived, he was doing a good job putting on weight and staying healthy. 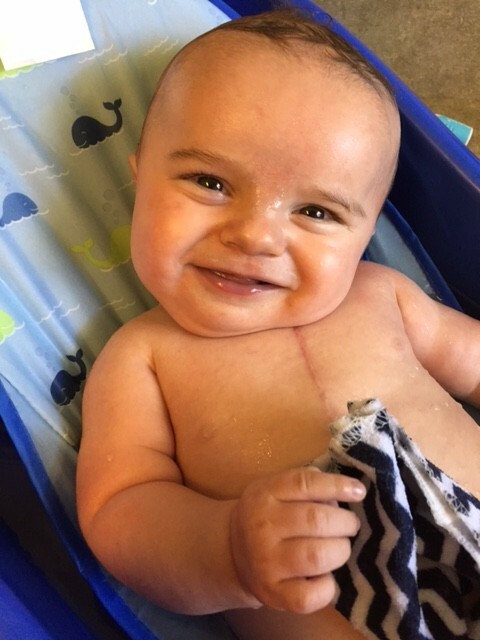 At 14 weeks old he had his first open heart surgery, the Glenn. There were ups and downs but after just 6 days he was discharged. The surgery was tough, the days and nights post surgery were even harder. However, all of that was finally behind us and we were excited to live life with surgery behind us and Adam in a stable condition. He will have another open heart surgery, the Fontan, when he is about 2 years old. We feel so honored to be Adam‘s parents, this little guy is truly amazing. He was placed in my arms and my husband Shawn and I got to hold him for about 5 minutes before he was whisked off, accompanied by my husband. But for those 5 minutes, everything felt normal. Kieran looked healthy and robust, and was a healthy weight and size. Despite the crowd of specialists and staff bustling about the room, for 5 minutes everything else stopped as I gazed at my son. Although he looked like any other baby at the time, when I look back now at pictures taken from his first weeks and months, I see how cyanotic (blue) he was. His tiny heart, made tinier by being absent a left ventricle, was desperately trying to get enough oxygen to both his body and lungs. Being left alone while Kieran and my husband left for the NICU was one of the hardest times in my life. I was unprepared for how it would feel to have my baby taken away so quickly, although I was grateful we had had at least a few minutes together before the whirlwind of medical intervention began. At the same time, I had a lot of joy to comfort me through those first few hours, because Kieran looked perfect despite having such a serious heart defect. I knew, somehow, he was going to fight through what was coming. 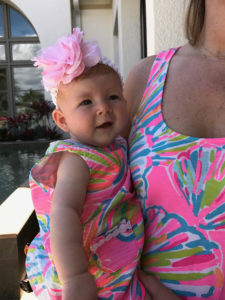 I had always felt that way, from the moment my OB had called me to tell me “I can’t see all of the heart,” through the perinatologist appointment where we were given the official diagnosis, through the long Easter weekend that had followed the news. Of course, it was devastating to learn something was so wrong with our baby. But along the way, we had consistent hope that Kieran should be given as many “fighting chances” as he possibly could. We were lucky to be close to one of the best pediatric cardiology centers in the country, where we started going for prenatal echocardiograms and meeting with the cardiologist who would become such a major part of our child’s life. Knowing about his HLHS before he was born made us, at least, familiar with what was happening, even though it was certainly difficult. Kieran stayed in the NICU for 7 days, and I was able to breastfeed a few times, and pump milk for him the rest of the time. He was like a typical newborn baby, in that he wanted to be held, fed, and he slept a lot. As the days wore on, however, his oxygen saturation levels were getting lower and he was getting tired eating even a little bit. It was time for his Norwood operation, although his surgery was pushed back an extra couple days to make room for emergency cases. Before Kieran’s Norwood, we met with a series of cardiology fellows, a cardiology nurse, and a cardiac anesthesiologist. They explained the procedure in great detail with diagrams. They told us that Kieran was a classic case of HLHS, and that they felt he was a good candidate for the Norwood. They explained that there were two common ways of doing the Norwood procedure: by doing a BT or a Sano shunt. The Sano shunt was the newer of these two methods, and had been developed by Dr Sunji Sano. The BT shunt was named after Alfred Bialock, Helen Taussig, and Vivien Thomas, who were pioneers in pediatric heart surgery (a movie called Something the Lord Made does a wonderful job telling the story of their work). Our hospital, along with other facilities, had just concluded participation in a large study comparing the BT and Sano shunts, and while there were not large differences in outcome, it appeared that the Sano shunt had better short-term outcomes, especially for lower birth-weight babies. 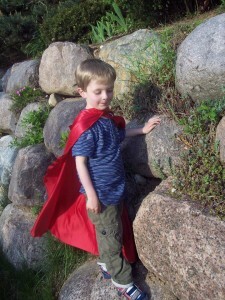 Our hospital had concluded their portion of the study a mere day before Kieran’s surgery. His surgeon would decide in the operating room which shunt to use. He ended up having the Sano shunt. Following his Norwood, Kieran did very well. At first, the number of monitors, IV drips, wires, tubes, and patches was overwhelming. My mother-in-law was visiting from out of state, and she thought to take pictures of the equipment in Kieran’s ICU room. Looking at these photos now, I am amazed by the amount of care and hard work that is invested in the treatment of HLHS. For the first night following Kieran’s surgery, the critical care doctors in the ICU did not take their eyes off Kieran and his monitors. They watched him so closely that I felt we must be in good hands. Little by little, those monitors, wires, tubes, and patches began to disappear. For us, each one was a victory. It meant progress towards healing, sufficiency, and going home. And of course, we could start to see more and more of our baby under all of that equipment! After three days, Kieran’s chest incision was closed up. Thanks to online networking and support groups, we had been prepared to see Kieran’s chest open after the Norwood. 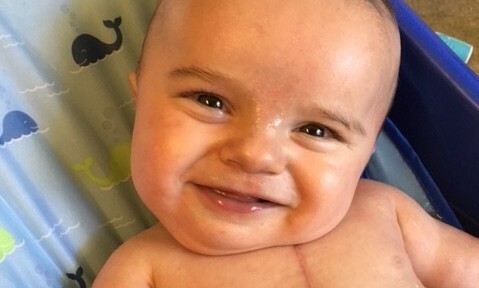 I had seen surgical pictures online, which for the average person may be alarming, but for me, it was enormously helpful in knowing what my son would look like post-operatively. For the most part, the ICU nurses kept his chest incision covered with a blanket until it could be closed, but there were a few times they had to remove the cloth. There was a clear patch over his open chest, and I could see his heart beating away right in front of my eyes. Later that day, a visiting friend told me, “You’re one of the few parents in the world who can claim she’s literally seen her child’s heart.” That was comforting to me. As a new mom, there was a lot that was “abnormal” about our first days together. In some ways, the normal bonding process and mother-child relationship had been disrupted. But there was a special kind of intimacy in being with our son through this difficult process. Kieran slowly started to eat by mouth again, just a little more each day. I was able to pump breast milk for him through the entire hospital stay, and he could drink some orally, as much as his recovering strength would allow. The rest was fed to him through an NG (nasogastric) tube. After 10 days in the ICU, we were moved to the “step-down” unit, where we spent two more weeks. Progress was not completely linear or constant, and there were days we felt discouraged by setbacks. One of nurses told us that this was completely normal, and that the journey “is a marathon, not a sprint.” As the inter-stage period (the time between the Norwood and the Glenn operations) is a period of a high mortality for children with HLHS, Kieran’s doctors wanted to be sure he was in the best possible shape before sending him home. There were some days where Kieran wouldn’t eat enough by mouth to satisfy the cardiology team, and he had unexplained tachypnea (rapid breathing). The hospital stay began to feel long because we could hardly wait to get home with our brand new baby. Since our stay there, the hospital has been remodeled, but at the time, we had to share a room with another family and only one of us could spend the night in the room with Kieran and his roommate. It was hard to have to say goodbye to Shawn every night, as one of us left for home and the other stayed by Kieran’s bedside. We did not qualify for staying in the Ronald McDonald House because we lived within an hour’s drive of the hospital. But our drive each way was 45 minutes, and this seemed far enough away to feel distant and lonely at night. We longed for the day we would all be under the same roof for the first time. The days in the hospital, however, were busy. I had milk to pump, and in the step-down unit we were able to assume most of Kieran’s baby care—feeding, bathing, changing, and rocking. We had to pass infant CPR class, learn to draw up medications, and start recording his daily weight, oxygen saturation levels, and cubic centimeters of food in a binder. We had to learn to mix high calorie formula with breast milk so that he would get enough calories every day. Kieran had to pass his car seat test, to make sure his oxygen levels remained stable when he sat upright for long periods of time. Finally, after 31 days in the hospital, we were going home! It was just after Labor Day, and the weather was thankfully still beautiful. During the interstage period before Kieran’s Glenn, which would be performed just a couple months later in November, we were supposed to avoid illnesses as much as possible, which meant not taking him around big groups of people if we could help it. Instead, we took him on long walks in the stroller on our local bike trail. Even at such a young age, you could tell he loved being in the fresh air, listening to the birds and the sound of the leaves through the trees. To this day, he loves the outdoors and wants to be outside as much as possible. The 10 weeks or so between surgeries were a time of both gratitude and challenge for our little family. We were thankful to be out of the hospital and have support from so many, but we were also feeling the pressure of another open heart surgery and hospital stay looming before us. We had a lot to catch up on, and a lot to learn. There were a lot of “eyes and hands” on Kieran, and although we were out of the hospital, it felt like our life was not completely our own. When we say “it takes a village to raise a child,” when it comes to HLHS, that village is made up of many medical professionals! We had an in-home nurse visiting weekly, as well as an occupational therapist and physical therapist. We continued to record Kieran’s weight, feedings, and oxygen levels on a daily basis in the hospital’s binder. Every week, a pediatric nurse would call us to review the numbers, and if any of the numbers were amiss, we would be asked to bring Kieran in for a special pediatric or cardiology appointment. We got to know our local pharmacists very well, as well as our pediatrician and clinic nurses, lab technicians, cardiologist, hospital dietician and of course, our insurance company. Before we knew it, it was time to schedule Kieran’s second surgery, the Glenn. Kieran had grown very quickly and put on relatively a lot of weight, so it was time by November. His Glenn was performed the day after Thanksgiving, when he was almost 4 months old. 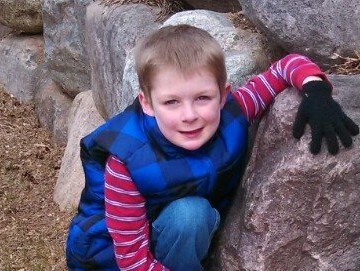 Although this was a shorter hospital stay—14 days—this surgery was more difficult for Kieran. Usually, the Glenn is considered a more straightforward surgery, but Kieran had problems with low oxygen and lowered heart function after the Glenn. No one is entirely sure why this surgery was harder for him, although one theory is that the incision made in the right ventricle for his Norwood may have somehow damaged his heart. After we were discharged, his decreased heart function continued to manifest itself over time, and finally, at a post-Glenn echocardiogram, his cardiologist became very concerned. Kieran’s heart was working too hard. The hard work was putting pressure on his tricuspid valve, which was moderately leaking, and his right ventricle was a bit enlarged. She told us that Kieran might not be a candidate for the next surgery, the Fontan, and that he might eventually need to be listed for a heart transplant. You can imagine how hard this was for us to hear—after all he had been through, it wasn’t working? Our cardiologist, however, decided to try two different medications, although she was somewhat doubtful that it would make a difference. With sadness and alarm, we went home to try the new medication regimen. This involved adding a diuretic to his daily aspirin and blood pressure medications—one that is usually used only after the Fontan. She also added digoxin, which comes from the foxglove plant. Over the next several months, we waited anxiously to see if things could improve, and miraculously, they did! No one can quite explain how Kieran’s heart was able to improve, but at his pre-Fontan catheter many months later, he was found to be a candidate for the Fontan. It is hard to live knowing your child will need another major open heart surgery. But I have come to the point where I am so grateful that he even had the opportunity to receive this very surgery. As “heart parents,” we do not want to see our children suffer, but we know our children need these life-saving surgeries to live their lives and fulfill their very special places in this world. And Kieran is definitely living his life! His life is different in some ways—he is on daily medications, he gets tired more easily than most children, he gets therapy to “catch up” with kids his age, and he has more doctor’s appointments and procedures than many children. In other ways, his life is “normal–” he goes to school, takes swim class, loves music, and plays outside. And yet, his life and his experiences are exceptional in so many ways—he inspires many around him with his strength, resilience, and unique personality. He’s brought us closer together with friends, family, neighbors, and strangers through his story and circumstances. He has completely changed our lives for the better, and for good.